Frank Cho certainly knows how to draw Wanda! 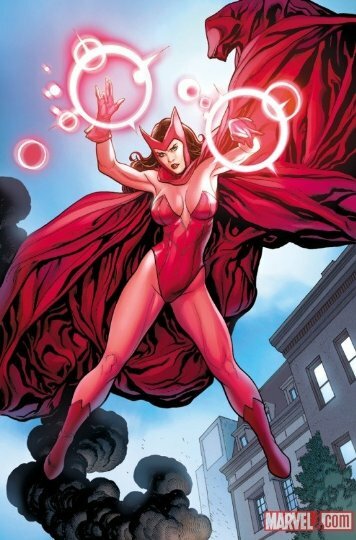 I don’t remember where exactly I first ran into the Scarlet Witch. Much like Wolverine, she was probably first introduced to me by the Official Handbook of the Marvel Universe Deluxe Edition. Her illustration was by the legendary John Byrne and the pose showed a little more life than many of the character shots in the book. Her name and powers fascinated me. And like many young comic fans, I probably thought she was pretty hot in that skintight red costume. When I finally started to read more Marvel books, West Coast Avengers immediately drew my attention. Wanda Maximoff and her husband Vision were on the team—much later I would find out they were just recent additions—and I instantly took to the split units under the pen of Steve Englehart and the pencils (for better or worse) of Al Milgrom. But it wouldn’t be long until John Byrne moved in to take over the book. From there, I was hooked on the life of Wanda as her family dissolved, her mind broke, she joined her father and was manipulated by Immortus. It was a fascinating story and it made me a fan of the character past the cool costume. Through the 90s, she remained a reason for me to regularly read Avengers and (ugh) Force Works. She went through something of a renaissance when Kurt Busiek and George Perez took over the book. Ultimately that would be her last high point in comics. Sadly, it seems Marvel’s current writers have no idea how to handle Wanda on the team. Brian Michael Bendis turned her crazy, had her kill her teammates and wrote her out of the book for nearly a decade. Allen Heinberg brought her back in the excellent Avengers: The Children’s Crusade only for her to go through more terribleness in Uncanny Avengers. In the end though, it doesn’t matter how badly they handle the character. 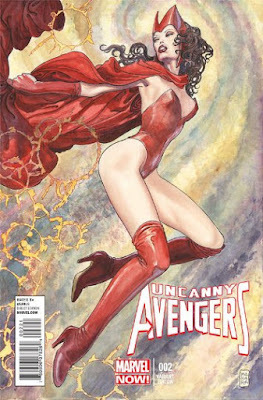 I still have those classic issues of Avengers where Wanda Maximoff remained was the most fascinating characters in comics. We saw even more of her as Elizabeth Olsen brought her to life in Joss Whedon’s Avengers: Age of Ultron. With a new solo series coming from James Robinson, Kevin Wada and a rotating group of artists, her prominence is growing in the Marvel Universe. Now cemented as a cast member of the Marvel Cinematic Universe at least for the foreseeable future, Wanda will remain a character of interest to me for many years to come. And that is the way it should be. Manara sure knows how to draw it.